The first business has opened its doors to the public at Leighton Buzzard’s new Grovebury Road Retail Park. Subway, which also has a town centre outlet, launched on Wednesday, December 5 and is bringing 10 new jobs as a result of its new branch. The shop looks a bit lonely on the desolate retail park at the moment with none of the other outlets anticipated to open until January 2019. Other stores on the horizon are M&S Foodhall, KFC, Pets at Home, B&M Retail, Topps Tiles and Costa Coffee. As the LBO reported in October, the final store could be Aldi, rather than Wickes. The discount supermarket wants to take over Wickes’ position as an anchor tenant, subject to planning permission being secured, with Wickes having agreed to step aside. The retail park originally gained planning permission in November 2013, with a condition that the presence of “convenience food retail” in the warehouses was forbidden. However, last year, with M&S keen to put a Foodhall on the site, Central Beds Council agreed to amend the Section 106 agreement to allow its presence. Retail park developer Claymore Phoenix is now seeking permission for a similar concession for Aldi and CBC will make its decision shortly. Despite targeting the Grovebury Road site, Aldi intends to keep open what would be a smaller base in Vimy Road as well. And, in fact, it has recently applied for planning permission to extend the town centre store and alter its car park layout. 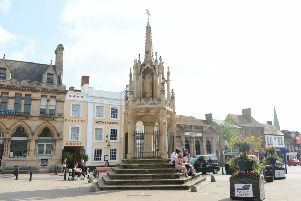 The plan is due to be discussed at Leighton-Linslade Town Council’s planning and transport committee meeting on Wednesday, December 12. It wants to increase the retail floorspace from 920sq metres to 1,255sq metres, improve the appearance of the building entrance and extend the existing glazed entrance canopy.